A few members of the Dieselbikes crew along with other local New England riders took a road trip to Diablo Freeride Park in Vernon, NJ. About a 5-hour drive from Boston, Diablo is one of the premier mountain bike parks on the east coast. The Diesel crew visited Diablo back in 2005 and since that time we were told Diablo installed a bunch of new technical trail features. So we decided to packed up the vehicles with our bikes, gear, video cameras and headed on down for a weekend of fun. In short, this mountain park offers an extensive array of technical trail features that is geared towards intermediate and expert riding levels. Riders of all skill levels are welcome, but we suggest (our opinion) you do not make Diablo your first downhill experience. 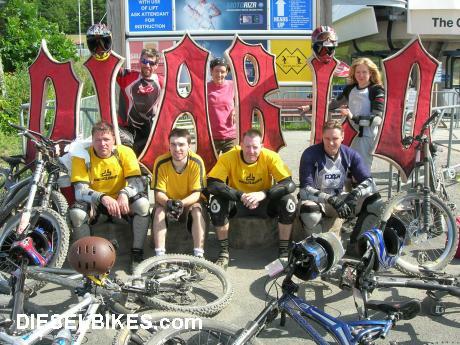 Diablo has been known to have a large number of rides hitting the trails every weekend. However, they have one of the best lift services for mountain bikers in contrast to other downhill locations. Their high-speed gondola can hole 3 riders and their bikes comfortably while getting you to the summit (vertical: 1,040') in about 7 minutes. At the summit, you have about 9 trails to choose from as you begin your wild descend. Trails like Triple Drop and Twist get your heart pumping with fast rocky rollers and sharp turns while Bushwack and Dirt Merchant provide you with smoother faster flowy action. You can also hit the dirt jump line on Dominion or start off with a sick "continuous" rock garden on BMW. Again, all these trails are just your beginning options. With over 35 separate individual trails and (approximately) 24 different combinations to link them, Diablo�s trail network offers more then you can ride in a single day. Our route of choice to start the day off is rather easy, but gets the blood going and your body loosened up. OTB to Lower Dominion to Upper Breakout followed by Alpine is a fast flowy run with some dirt jumps, technical rock gardens and a little of everything between. Switching through these trails is just a teaser of what the mountain has to offer. There is so much we can write a book, so we will just give you some highlights of the trails we like the best. Tempest, located on the north peak via Exodus is a fast well-groomed trail that has a balance of jumps and berms allowing you to pump your bike and maintain speed with minimal effort. With a few small rock drops and a sweet ladder bridge drop-off, Tempest is a run you can double even triple up riders back to back with ease. This trail is one you can session all day and still come back for more. BMW, located just to the left as you exit the lift is basically an 800'(est.) long rock garden that will test your skill along with your nerve. This trail starts with a sweet rock roller to a short flat rocky section. As the trail narrows, it begins its steep decline into a vast sea of loose rock and large stone. Forward motion is your friend and speed control is critical when negotiating this trail. BMW is one of the top 5 technical trails at Diablo. Triple Drop, located to the sharp right of Dominion is an excellent trail that allows you to maintain speed through sections of rock gardens, short ladder bridges and succession of kickers adding to the flowy fun of this trail. Again, all the trails we rode, we loved. Each trail has its own unique features and it�s hard to compare this downhill location to other locations in New England. In our opinion, Diablo would be a combination of Highland Mountain (Northfield, NH) and Attitash (Bartlett, NH), but still unique in it�s own respect just as these other locations. Our accommodations were excellent. Our group opted to stay at the Black Creek Resort located minutes from the lift service. With 9 individuals, our cost per person for a 2-nights, 3-day stay in a 3-bedroom condo was $90.00. Not to shabby when you have access to a pool, hot tubs and propane grills all included with your stay. There is other cheaper lodging available along with camping locations, but the cost per person ranged from $40 ~ 80 depending on the location. In all, our Diablo trip was fun and well worth the drive and expense. We had a few serious crashes, but everyone in the group walked away. We suggest you get a group of your ridding buddies together and head on down before the season ends. This place offers a lot for mountain biking and has other stuff to do if you are hurt and or do not want to ride (mountain side water park). With a local bar, supermarket, bank and gas station located minutes from the mountain; Diablo lives up to its slogan "Nothing Else Matters".